The Galaxy S8 and S8+ do not have Samsung’s standard physical home button. Whether that affects you or not, I could see where long-time Galaxy fans could be disappointed since they’ll have to learn the ways of the on-screen navigation bar. However, the company is doing one cool thing with the virtual home button that should bring everyone bundles of joy. The Galaxy S8 has a press-sensitive area at the bottom of its display where the on-screen home button sits. This area allows you constant access home no matter what you are doing. So even if the button isn’t showing (Ex: you are in a full screen app or you have Always-on Display turned off), you can touch the area with a bit of extra pressure (“hard press”) and the phone will return home or wake or even unlock. It’s awesome! When or how would you use this? So far, I’ve found this feature to be most useful from the lock screen or when the phone is locked. I have mine setup to allow the phone to be unlocked with a “hard” press, which is perfect when paired with Smart Lock, so that I never have to reach for that terribly placed fingerprint reader or hope that facial recognition works quickly enough. Again, you can also use the hard press on the home button when in any full-screen app and the button isn’t showing. All you have to do is hard press the area where the home button would be and it’ll activate. You can even turn off Always-on Display and still hard press the area, even with a fully blacked-out screen. In Settings>Display>Navigation Bar I have the option turned “ON” for “Unlocked with Home Button.” This allows me to hard press the home button from the lock screen and fully unlock my phone. Now, you can use the home button to unlock your phone once you enabled the option above without a secure lock screen and enjoy your day. All you need to do now is just press that area and your phone will unlock without swipes or any extra work. However, if you want a secure lock screen to protect you from bad guys, Smart Lock is the next step I would recommend. 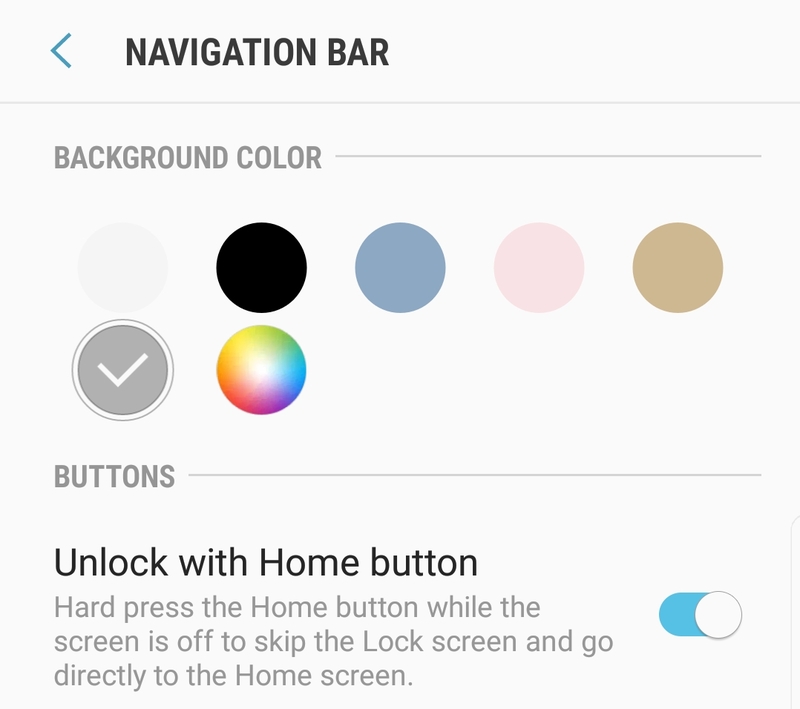 You’ll now need to pick a secure lock screen option (pattern, PIN, etc.) in Settings>Lock screen and security and enable it. From there, it’s on to Smart Lock. 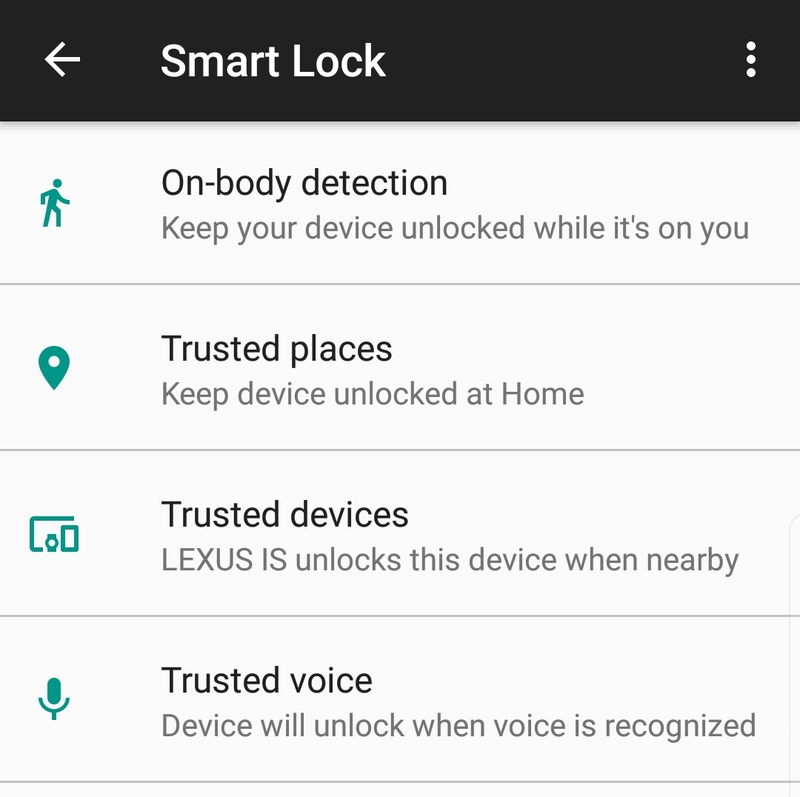 In Settings>Lock screen and security>Smart Lock you’ll find options for setting up Smart Lock trusted places, trusted devices, on-body detection, and trusted voice. Consider setting up home and work trusted places, your cars as trusted devices (via Bluetooth), that sort of thing. That way when you are at the places you visit the most and connected to regular Bluetooth devices, your phone won’t need to be fully locked and you can bypass your secure lock screen temporarily. To learn more about Smart Lock, hit up this series of posts. For a video explanation of all of this, watch our First 10 Things video on the S8. You’ll see my full lock screen setup around the 6:40 mark. With all of that set, you should now be able to simply hard press on the Galaxy S8’s virtual home button to unlock your phone. And trust me, you’ll want to do it. It not only allows you to quickly unlock your phone, but its pressure-sensitive vibration might make you aroused happy.